Life After Ironmans, Ultras.. next? 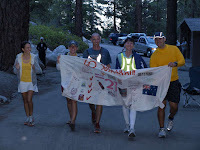 : Badwater Part 3..Finish. One thing I forgot to mention was that during the late night hours I had to devise a make shift chiropractic table and perform some adjusting. As we were heading out of Stovepipe wells towards Town's pass, Susannah was have some mid-back pain and I worked on some of the muscles as she walked for a few minutes and told her that we would have to stop for a couple of minutes if she wanted me to adjust it. She said she would go longer and let me know when she was ready, well, about 4 am she was ready! Geraldine and I quickly stopped, pulled out the big long cooler we had and set it behind the Mothership, covered it with a little towel. As Susannah walked up I laid down over it instructing her how I needed her to lay on it. She was approaching and removing her fuel belt and things, quickly laid down, I immediately went to the location, sure enough, out of position. A few quick adjustments, I told her to stand up, I did some quick range of motion muscle work, rubbed some Traumeel on it and put her belt back on and off she went! It was literally like 3-4 mins! a complete pit stop as we had refilled her water bottle too. As she walked off she said it feel better but I still feel it. I said give it about 15-20 mins. As she walked ahead, I asked about 20 mins late, how it feels. She said she didn't feel it anymore!! I quickly rubbed some more Traumeel on it and she continued on. 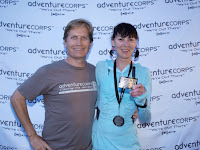 I actually asked her heading up to finish about mile 128 how it felt and she said she never felt it again after that!! Nice, huh! Once passing the check point and heading up the Portal road we had decided that we would each pace for about 4 miles. Geraldine was up first and was excited to be out there! She had been working hard all morning, supplying us with breakfast runs, hotel stuff and anything else. As we started up the road we were about 3 miles up and I happened to look down at the GAS!!! It was at just under a 1/2 tank and I thought to myself how far we could actually go. Last year, it was a must to full the MotherShip at Lonepine and this year it was the plan too but I just over looked it as we rolled through downtown. I knew we would be really close on the gas or run out and to have the crew worry about it and myself included was not worth it, we were still close enough to turn around and be back in a 15-20 mins. I told the crew and made the decision. We stocked Susannah and Geraldine and quickly went to put gas and returned in just about 15 mins. Now it was time for me to take over on the pacing duties for a few miles. As I hit the road it was really just a super fast power walk. It was great to be out there and talk with Susannah and her journey the last 34 hours. She was tired and as the road started to tilt up she started to slow down some. I tried to keep her at pace because she was still 4th overall women but 5th was less than a 1/2 mile behind and working to catch us! Swiss Miss was her call sign and she was in the same starting group as us. She had gotten ahead of us by a long shot but had some troubles and had really slowed and we caught and passed her but in typical Badwater fashion, athletes rest and recover to amazing abilities and was working her way back up to us. As we reached mile 131 at 33 hrs 58 mins (15:33pace) she was ready Nic to come and pace the last few miles up. She had already asked when he was coming out so I knew she was ready for him. As Nic took over I told him not to let Swiss Miss pass us as she was about a 1/4 mile behind. He said he would do his best. Funny how there is a competition with the Crew's unbeknown to the runner!! Susannah worked those last 4 miles but they also worked her! The road here is just so STEEP the Grade is crazy and she managed to hold on to a 20:30 pace per mile. As we reached the finally 200 meters we went to park the van and run down just a few meters to meet her! 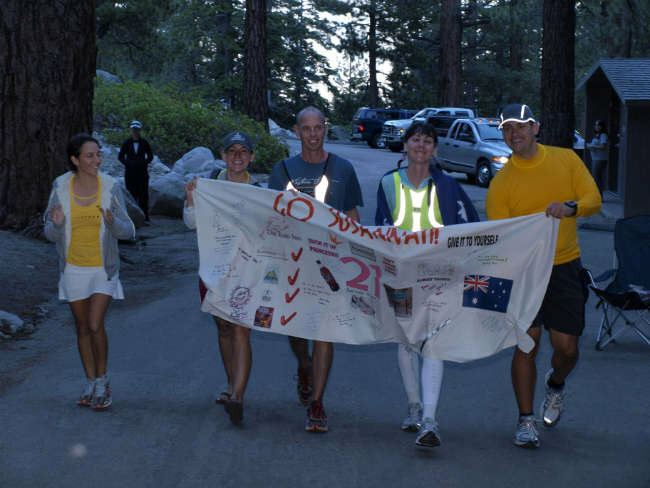 We got the Banner ready, the Aussie Flag and there it was the Finish line, She could see it in sight! As the chills started to roll all over my body its just a feeling that indescribable. We all lined up with the banner. Chris, the Race Director was taking pictures and others were holding the finish line tape. We all jogged to the tape and Susannah broke the line as cheers and applause sounded off!! 135 miles in 35 hours 20 mins (15:42 pace) Amazing! We all hugged and cheered as she thanked us for getting her there. Then we quickly had to move out of the way as Swiss Miss was finishing up 1 min 12 secs behind! It has taken a couple of weeks to really reflect on the race and emotions. I mean, I met Susannah through an email via fwd from Molly. Agreed to help her and not even know her! I mean who does that? Not only that but agree to help someone in the Worlds Toughest Endurance event! I do, that's Who and I would do it again next year if given the chance. The lure of Badwater is just amazing. The scenery, the elements, the sleepless hours and the ability to see someone push their bodies to the limit. It's Desire, Ambition, and Dedication that is the drive for so many and I think for me that is my fun in being there. This year was different than last year. It was a only 5* cooler but I felt there was much more wind and that just made for a Hot Blow Dryer effect! There was less crew members and a little more work, although I drove for the most part, that in itself was a lot of concentration. 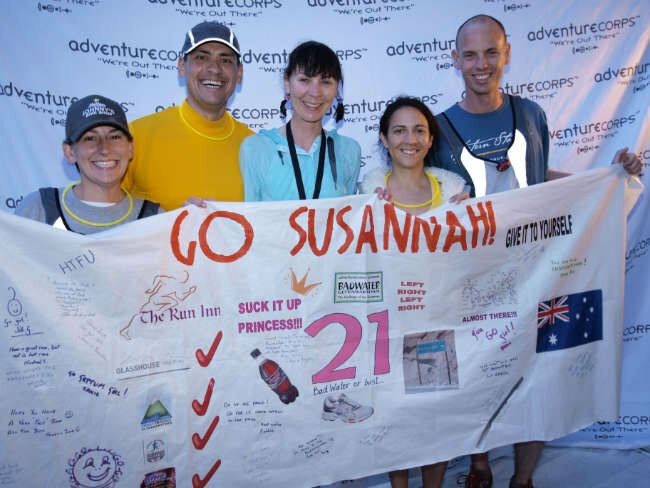 I will be forever grateful to Susannah for having me on her crew and letting me experience another year at Badwater. 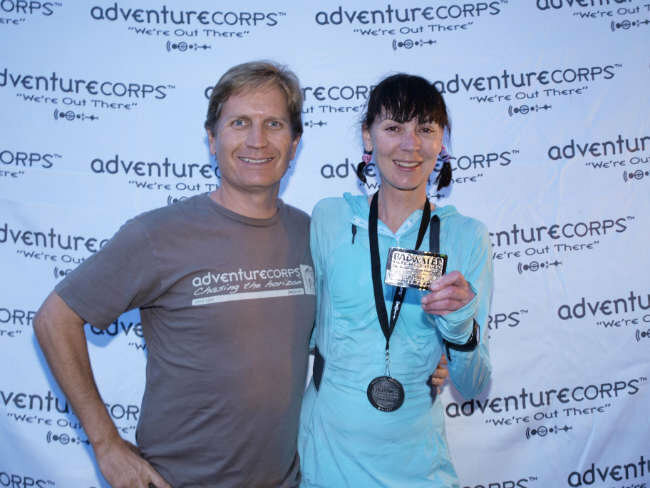 I am thankful I was able to help her in her time of need and along the course and help get things organized along the way leading up to the race. I am sure I will be reflecting on things as time continues but I do know that now, as a Veteran crewer only brings the dream of one day completing this amazing event!